Just in case you didn’t notice, sweet and juicy peaches are ready for picking. If you happen to get lucky and find enough extras for something besides immediate eating, here’s a quick recommendation. Don’t try the eggless peach pie, which for us was a complete flop and waste of good peaches. Although it came out of the oven looking glorious, it just didn’t cut it – literally, you couldn’t cut it because it was just too darn goopy. So why heat the oven and get all flustered? 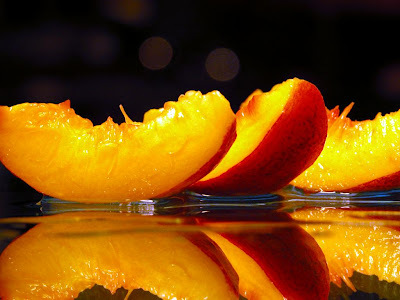 Keep the day peachy by giving this no cook, refreshing brandied peach parfait from Epicurious.com a go. http://www.epicurious.com/recipes/food/views/Brandied-Peach-Parfaits-232510 You could substitute the ice cream with yogurt for a healthier dessert. * Weed – if you have a bumper crop of flowers and fresh veggies in your garden, you most likely have an extra helping of them weeds. It makes me almost want to give up in the garden when the weeds take the number one position. But it must be done so use a cool morning to tackle and regain your garden momentum. * Give your tomatoes a shot of copper to protect them from various late season diseases or to keep what’s present at bay. Keep your eyes out for the tomato horn worm. It’s that destructive time of the year for this bug. The tomato horn worm can grow the size of your pinky and defoliate an entire plant. * Deadhead your roses and perennials to keep them clean and fresh. We are in the shoulder of the mid-season flower slump so clean up your perennials with a quick buzz cut. * Water, water, water – every tree, shrub and flower is getting hot and dry so stay on top of our garden’s most precious resource. One of our farmer friends told us they lost several blueberry plants when they stopped irrigating during last year’s late season hot stretch. Even after the plants produce their fruit, a supplemental drink is necessary to keep everything healthy. * Plan for dividing – perennials should be divided and transplanted mid-August. This gives the plant time to root and get established before the winter months plus you can spread out your pizzazz. You can easily work out the color chart because the bloom is fresh in mind. 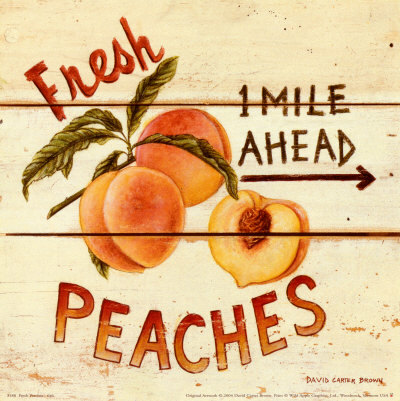 So keep it peachy and fresh in your garden. And if you are just focusing on apple picking season, listen wisely to George du Maurier. "An apple is an excellent thing -- until you have tried a peach." Don’t miss out on this lucious fruit.